This is the first of a six-part series by City Manager David Neeley based on his 2011 State of the City Report. As we begin a new year, it’s important to take a moment and reflect upon 2011, which will likely be remembered as one of the most critical in College Station’s 73-year history. While this may have been my first year as city manager, it wasn’t my first year in city management and it was likely one of the most challenging I’ve experienced. In light of a tenuous political environment, an uncertain economy, and an increasing demand for high-quality service that our citizens and visitors not only expect but deserve, we as an organization accomplished a great deal. We will be stronger for what we have endured. The accomplishments and progress we’ve made as a city, despite seemingly insurmountable challenges, wouldn’t have been possible without our highly-qualified and professional staff, which has devoted itself to the betterment of our community. The positive contents of the 2011 State of the City Report are the result of our staff’s hard work and dedication, and they all are to be commended for it. Through identifying and implementing the strategies for each of the key initiatives, the city has been able to achieve quite a few significant accomplishments that help us realize our collective vision for College Station. While the report highlights many of the major achievements and milestones reached in the past year, it’s by no means a complete account of all the good things we as an organization have realized. The past year continued to be a difficult one for the economy at all levels, which slowed revenue growth and impacted the city’s long-term financial condition. Taking this into consideration, the City Manager’s Office and each department examined our organizational structure, programs and practices as we prepared for the Fiscal Year 2012 Budget. This resulted in the implementation of a reorganizational plan that took effect in July. The reorganization impacted several departments and generated considerable recurring cost savings, and it significantly improved efficiency by refocusing resources on core services. In total, the reorganization and subsequent reduction of 27.25 budgeted full-time equivalent positions saved the city $1.2 million from the General Fund and almost $300,000 from other funds. In the last four years, a total of $7.1 million has been removed from the city’s Operations and Maintenance budget. While the budget was exceptionally difficult to prepare and included very painful cuts, especially in regard to our staff, the nearly $250 million budget was ultimately about planning for College Station’s future. I continue to believe that the FY 2012 budget makes that future a little more secure. We are continually challenged to keep our tax rate among the lowest in the state for similar-sized cities so that we remain competitive and an affordable place to live. 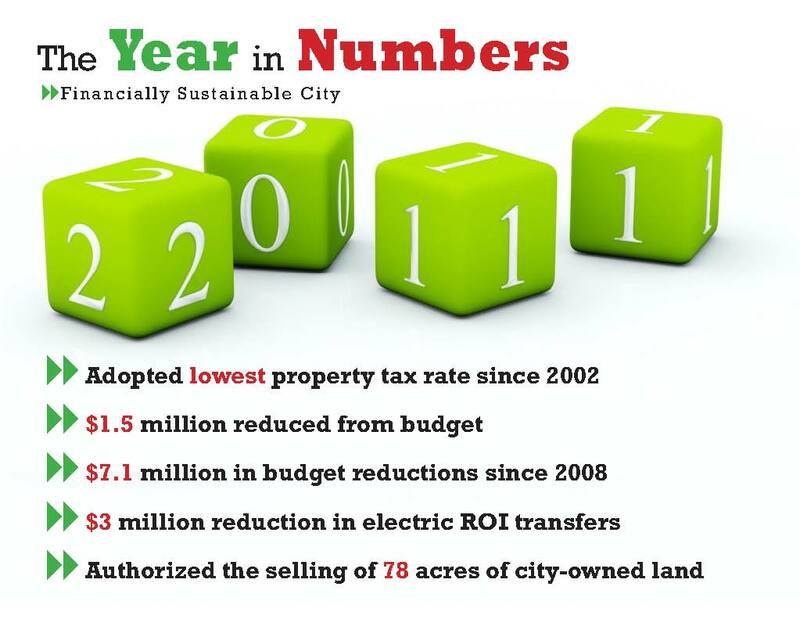 Due to new construction, increased property valuation, and the difficult budgetary decisions that we made, the city was able to adopt the effective tax rate of 43.7995 cents, a net decrease of 0.9548 cents from the FY 2011 tax rate. That makes us one of only two taxing entities in Brazos County to reduce its rate this year and our low rate remains one of the lowest in the state. The city council has made it a priority to begin a phased reduction of the Return on Investment (ROI) transfer from the various utility funds to the General Fund. Previous policy capped the ROI at 10.5 percent of electric operating revenues. In preparing the FY 2012 Budget, staff implemented a new plan to utilize an “in lieu of franchise fee” that is now capped at 6 percent of electric revenues. This reduces the transfer by $2 million in FY 2012 and an additional $1 million in FY 2013. These reductions in ROI resulted in no electric rate increase in FY 2012, though one is forecasted for FY 2013. Through the efforts of the City Attorney’s Office and the city council, the city has resolved a number of emotionally-charged and highly-publicized lawsuits in the past year, including Weingarten, Save Wellborn, BVSWMA, Wellborn Water and a contested case before the Texas Commission on Environmental Quality. Resolving these outstanding cases has been a very important step and has improved our residents’ perception of the organization. For almost a year, the Parks and Recreation and Public Works Departments led an effort to improve the way we manage our landscape contracting. Previously, landscape maintenance was a patchwork of public works crews, parks crews and contractors. Through an extensive request for proposal process, it was determined that such work could be completed more cost effectively by a contractor, while public works could still maintain the various rights-of-way. By playing to the strengths of the contractor and our own departments, the city will save about $125,000 while increasing the number of parks served from 11 to 37 and the frequency of maintenance at neighborhood parks from 18 to 28 times per year. While this is only one example, there are literally dozens more innovations and efficiencies that have been implemented by our staff to ensure taxpayers are receiving the most cost-effective service possible. Tomorrow’s blog will examine what’s been accomplished under the Core Services and Infrastructure initiative. This entry was posted on January 30, 2012 by City of College Station. It was filed under City Manager, Public Communications and was tagged with state of the city.